Judy Macdonald Johnston speaks at TED University, where audience members from TED2013 get the chance to speak. 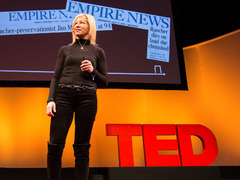 “What would be a good end of life?” Judy MacDonald Johnston asks in today’s talk, given at TED2013. Her answer — based on her own experience of helping two friends face death in a way that respected the incredible life they’d built — involves five practices, all of which can help maintain a high quality of life even as independence and bodily function decline. We talk about how to live the good life all the time. And yet, though we all face death, we’re less willing to talk about what would be a good conclusion to life. Here, some further reading, watching and listening on this hard but important topic. Read: This Wild Darkness. In the mid-‘90s, Harold Brodkey wrote a series of essays, mostly for The New Yorker, about his experiences and emotions as he died of AIDS. In these essays — subsequently published in a single volume as This Wild Darkness: The Story of My Death — Brodkey reckons with the realities of both his impending death and, through that lens, his life. His style can be self-aggrandizing, but ultimately, the book acts as a case study of how self-reflection through writing can make nearing death a little bit less terrifying. “The obsession with literary power games, with recognition and reputation, gradually subsides and gives way to something like acceptance,” Michiko Kakutani wrote in The New York Times upon the book’s publication. Watch: A Will for the Woods. The new documentary A Will for the Woods, featured in our roundup 9 documentaries that you need to see in 2013, follows psychiatrist Clark Wang as he battles lymphoma and arranges his own burial. His resolve for a burial that helps, rather than harms, the environment spawns the first natural burial ground in the state of North Carolina. The film’s website notes that green burials were the norm “before the contemporary funeral industry propagated expensive and elaborate funerals as traditional,” and applauds the growing demand for them now. Bookmark: New Old Age. The New York Times’ “New Old Age” blog, which Johnston links to on her own website, explores what it’s like to care for adults over age 80. Recent posts are on Vermont’s passage of the ‘Aid in Dying’ measure, a look at a recent study on dementia units, and what millennials need to ask their parents while they can. Listen: “When Prolonging Death Seems Worse Than Death.” Last year, Fresh Air’s Terry Gross interviewed Judith Schwarz, of the nonprofit Compassion & Choices, about end-of-life decisions for the terminally ill. In the interview, Schwarz argues that terminally ill patients should have the right to choose to die sooner. Beyond dealing with the realities of what terminal illness means, the interview offers a thoughtful, compassionate way of looking at the multiple and varied desires of the dying. That is: it’s a lesson in empathy and a reminder that though some ideas may frighten us, it behooves us to look at them in depth. In the story, Schwarz also prods us to consider what it really is like to live through a painful end-of-life, and suggests that in some cases, death is not the worst option on the table. And that’s okay. Bookmark: Seven Ponds. The website Seven Ponds aims to “promote a healthy attitude towards the process of death by encouraging a meaningful experience that is in harmony with the environment.” Their recommendations: cremation and natural burials (see #2, above!). “We see a world where everyone can experience death in their own personal way and feel it’s all okay,” writes Suzette Sherman, Seven Ponds’ founder. For her blog, go here. Reblogged this on Engines Revealed.